PIZZA TEEN! 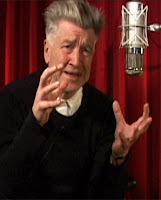 : David Lynch on the notion of watching movies on your cellphone or computer: "It's the most sickening, horrifying joke"
David Lynch on the notion of watching movies on your cellphone or computer: "It's the most sickening, horrifying joke"
UPDATE! Perceptive reader Tanya R. notes... "He was on NPR yesterday (I always enjoy hearing him because he's such an affable guy, really, AND his voice is so intriguingly annoying) and railed on director's commentary tracks on DVDs, calling them the 'greatest absurdities of life.' I laughed out loud." Here's a link to the interview (Windows Media Player or Real Player only, apparently). Yes, he ends up talking about transcendental meditation a LOT again, but there's some new territory, as well. The only thing possibly more annoying than watching a film on a computer is listening to David Lynch tell us why we shouldn't. Arrogant, overbearing, and otherwise defensive of the one thing he does best: make movies for the silver screen. What else would you expect from one of the most original directors of all time? I would suggest he meditate a little longer each day. Recorded music, for instance, has survived the transition from vinyl to cd to mp3. Isn't it great to know that they're all still available? I wouldn't presume to tell anyone else which they should listen to. But then, I'm not David Lynch. Four Times The Fun: Blowing Up Mannequins! Speak To A Recruiter! Win An iPod! Absurd Juxtaposition #0004 - VIDEO! Absurd Juxtaposition #0003 - VIDEO! Man on the left vs. Man on the right. Who wins? The Jazz Butcher Conspiracy "Angels"